The tool for enrolling students on or removing students from an organisation site will be updated during the Blackboard upgrade scheduled for 18-20 January 2019. This updated tool will now instantly enrol students on or instantly remove students from an organisation site. There will no longer be a delay while the system updates site enrolments. The process is similar to using the existing tool in that you will still need to know the Blackboard organisation ID and have a plain text or comma separated (CSV) file with the student numbers you wish to enrol or remove which you upload to the Student Enrolment Tool. 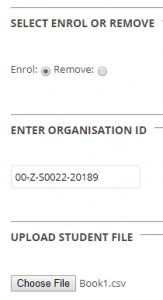 You will then see a confirmation screen asking you to confirm the students to be enrolled or to be removed, and once confirmed the students will be instantly enrolled on or removed from the organisation site. Modified instructions for using the tool will appear on TEL Help following the Blackboard upgrade.